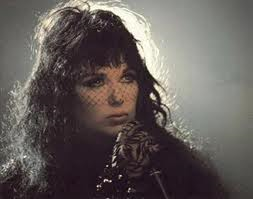 When I was about 14 I had a major style crush on Ann Wilson from Heart. I loved everything about her from her big hair, dark rimmed eyes and especially her penchant for wearing corsets over long dresses with pixie boots.I didn't realise it at the time but she was also the first Woman I ever saw being trolled about being fat. The rock music press of the day more used to seeing Tawny Kitaen sprawled across David Coverdales car never missed a chance to point out she was curvy. I remember just thinking she was a goddess and being delighted when a girl at school told me I looked like her. Coupled with my Madonna fixation it cemented a life long love for backcombing and wearing underwear as outerwear. Fast forward a few years and I fell in love with burlesque where performers wore corsets as part of their costumes and many of the audience members did too. I still love a corset although I always prefer to wear them as fashion items rather than go for the traditional saucy strumpet look. With bangers as big as mine it can look far too much like I should be an extra in a period drama brothel scene but that's just personal preference-you know my view wear what you want, how you want. So when the company Corset story approached me to see if I would like to sample one of their corsets and skirts I jumped at the chance to create a homage to Ann Wilson with a dash of Bellatrix Lestrange thrown in for good measure-dark fairy, big hair glamour vixen. Because this isn't the eighties I have put my black short tutu and corset with leggings and trainers. I feel this looks more modern and less panto fairy. I've teamed it with a black shrug and big necklace (Primark) and because wearing a full corset and jeweled collar is simply too understated a pair of glittery cat ears. I feel quite other worldly in this outfit and yet also quite goth princess. What a delicious combination.Sometimes its just fabulous to use clothes to indulge your whims. It doesn't matter what size, shape or age you are, embrace the part of you that enjoys dress up. This black brocade sweetheart corset goes up to a size 24 and Corset Story have very kindly offered me one to giveaway to one lucky reader. Nip on over to Corset Story and take a look at their skirt collection. Pick which one you think goes best with this corset. Leave a comment below mentioning which skirt you would choose along with your email address.